~You will receive (101) Elongated Pennies ~. ~ Combination of Zinc & Copper ~. You are viewing the DisneylandResort Pressed Penny Set Mary Poppins. This set was pressed using circulated pre 1982 pennies. The set is back stamped with the Mary Poppins logo. 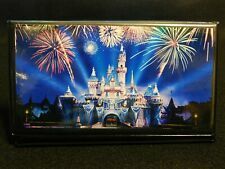 This set was released April 8, 2019 in the Penny Arcade in Disneyland. PENNY shown in my image. Any "blur" is due to a bit of coin curve which. Request information as necessary. Mistakes can happen but I do my very best to NOT make errors. When it works for you, try using the. 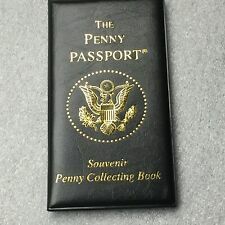 Up for sale the new and improved Penny Passport. This album holds 36 elongated pennies as well as 8 elongated quarters for a total of 44 coins! This book retains it's original tri-fold album which makes it very portable. Souvenir Of Glacier National Park elongated penny pressed on a 1963 copper cent. 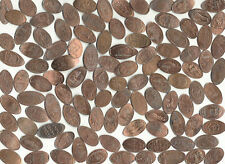 We list thousands of Elongated Pennies monthly! TOP CAT COINS. ELONGATED COIN - LEWIS & CLARK EXPOSITION AGRICULTURAL BLDG. Set of Four Copper Elongated Pennies from The Petrified Forest in Calistoga, CA. There are two sets available so the coins pictured may not be the exact coins you get. All are rolled on red pre 82 copper cents. Free shipping. It appears to be in good used condition. This is a pressed/elongated quarter from a retired machine at Disneyland in CA. It features the character Pegasus from the Disney film Hercules. This is a zinc penny set. The pennies in the machine are zinc but they look real good they are new pennies. You do not put any pennies or coins in the machine. 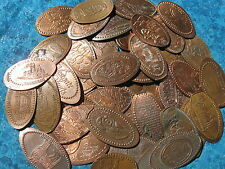 We list thousands of Elongated Pennies monthly! Glenn and Teresa. TOP CAT COINS. CLEVELAND OHIO-ELONGATED / PRESSED PENNY. THE PENNY IN THE PICTURE IS THE ONE YOU WILL RECEIVE. As pictured. Great cent to add to your collection. PENNY shown in my image. Any "blur" is due to a bit of coin curve which. Request information as necessary. Mistakes can happen but I do my very best to NOT make errors. doesn't affect the actual design. UNSEARCHED!! 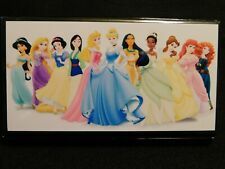 Over a Million SOLD on EBAY! Little album for collecting coins. Dated 2015. Good condition. 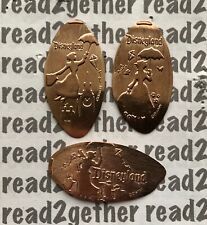 These all copper pressed pennies feature all seven great designs including Sorcerer Mickey, CyberSpace Mountain, Pirates Of The Caribbean, Space Goofy, Aladdin & Jasmine, Astronaut Mickey and the Disney Quest logo. I will combine shipping on multiple wins. The first coin is $0.60. All additional coins won are $0.15 as long as they are included on the same invoice. I do allow time to win other pending auctions. All I ask is that you keep the time reasonable between the auctions won. Thanks and good luck. For all international customers, if you are interested in bidding on any items, and don't want to pay eBay's ridiculous shipping fees, please message me and let me know what auctions you are interested in. That way if the global shipping option is not turned off, it will give me time to turn it off. eBay will not allow me to send an invoice directly to you and you will be forced to pay their fees. If you have any questions please let me know. Three Keene State College Elongated pennies: All copper coins!